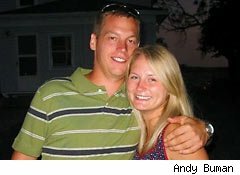 Andy Buman, 29, got interested in real estate a few years ago while working in construction. Since then, he has purchased two bank-owned single-family homes near Omaha, Neb., as rentals, and last fall bought a primary residence for himself and his fiancée, Valerie. He has managed to save $20,000 in cash, and is looking for the smartest way to apply it. From the outset, Buman focused his real estate interests on a few small towns surrounding a retail distribution warehouse and a trucking center, about 25 miles from Omaha. The Omaha/Council Bluffs, Iowa metropolitan area had an unemployment rate of 4.9% in June, which explains how Buman managed to rent both homes five hours after listing them. "There's a lot of employment -- services, farming, cattle, railroads, stores -- it's not hard to get a job here," says Buman. "A lot of employees want to be close to work and the cost of living in these little towns is next to nothing." His first purchase was a two-bedroom, 900-square-foot home for $24,000. He invested $5,000 in repairs, rented it for $550 a month, and has already paid off the mortgage. Buman followed up with a four-bedroom 1,500-square-foot home. He paid $34,500, invested $7,000 in repairs and rented it for $700 a month. The home still has a mortgage balance of $16,500 at 5.5%. Last fall, Buman and his college sweetheart, who are marrying later this month, bought a three-bedroom ranch 10 minutes from Omaha for $185,000. It's close to family, and to the University of Nebraska Medical Center, where Valerie begins her residency next spring. The home has a 30-year, fixed-rate mortgage at 4.25%, and a balance of $168,000. When the balance on the loan falls below $148,000, the couple can stop paying mortgage insurance, which costs $94 a month. It would save about $2,500 in interest that Buman would have paid over the remaining life of the loan, and improve his cash flow by about $330 per month -- or nearly $4,000 per year. Buman could then apply the rest of the $20,000 -- $3,500 -- toward the 4.25% loan on his home, as well as the monthly $330 he had been paying on the rental mortgage. That would put him in a position to eliminate his $94 mortgage insurance payment in 25 months. In essence, the $2,500 in interest that was saved on the rental property mortgage offsets the mortgage insurance payments he has to make while paying down his personal mortgage. If Buman continued to apply the $330 month after month, he would cut off about 13 years from his 30-year mortgage and save $61,000 in interest over the full life of the loan. Moreover, even if Buman put the whole $20,000 toward his personal home loan, it might not allow him to eliminate the mortgage insurance payments, says Keith Gumbinger, vice president at HSH Associates, a mortgage information publisher, who crunched the numbers for DailyFinance. Fannie Mae regulations require a loan to be "seasoned" before mortgage insurance can be canceled -- which typically requires two years of on-time payments and a loan-to-value ratio of 75%, he notes. The only exception is if the borrower has made significant improvements to the property. Buman would have to contact the loan servicer and get its policy in writing before sending in $20,000 and requesting a cancellation. Since he's in such a strong financial position, Buman might consider a third option, says Gumbinger: Buy another investment property. "He has been so successful, he may want to leverage the $20,000 into something else if the rental market would support another investment property," he says, adding with a laugh, "on a pure pay down basis, he's far exceeded capabilities of most mortal men." Struggling with a personal finance situation? I welcome your questions but also your wisdom, ideas, and experiences that may help other readers. Email me at laura.rowley@teamaol.com. You can also follow me on Twitter @MoneyHappiness.